Upgrade the MOTU interface's included AudioDesk to Digital Performer DP9 with this specially-priced crossgrade combo. Exciting new plug-in processors, a powerful synth and many workflow enhancements headline this major new upgrade. Developed by synth guru Erik Norlander, this exciting new soundbank spans the EDM sound spectrum, from deep house to neo disco to electro swing. You'll find presets that inspire new directions, and with a little tweaking, define your unique sound. Browse dozens of basses, leads, pads, arps, sample & hold and rhythm blocks. These presets are a showcase for MX4 as a synth programming powerhouse. Digital Performer's spot-on emulation of the classic 1176LN compressor includes all the quirks of the revered D/E revisions, including "all buttons" mode for absolute slamming, when needed. There's no fuzz box quite like Craig Anderton's seminal QuadraFuzz™ — except DP9's new MultiFuzz™, which faithfully reproduces the unique fuzz tones of the original hardware kit from the 70's. 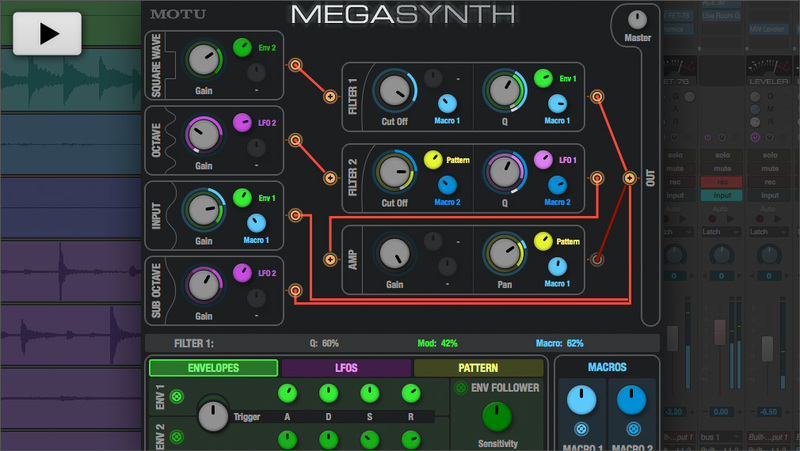 MegaSynth combines polyphonic octave generation with flexible signal routing, envelopes, LFOS, a pattern generator and macros. Input your guitar — or any signal — and let the synthesis mayhem begin! 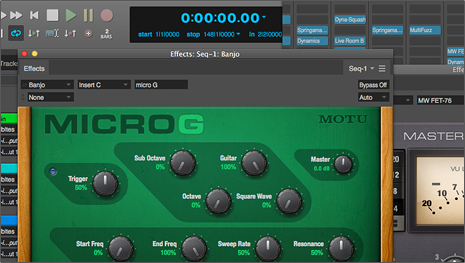 MicroG is a subtractive synth processor that emulates polyphonic octave generators (POGs) streamlined for guitar. Try it on vocals, instruments or any type of signal for truly unique effects! Tuned for bass guitar, MicroB lets you get your Funkadelic on, with that classic bass sound from the 70's made popular by Parliament. But that's just the beginning with this synth processor. Mix automation can add life to a flat mix, allowing it to breath with the musical ebb and flow of the track. Automation lanes display each type of automation data — volume, pan, plug-in settings like filter cutoff — in their own lane below the parent track, giving you the clarity you need to perfectly dial in your automated mix. Show as many lanes as you like. 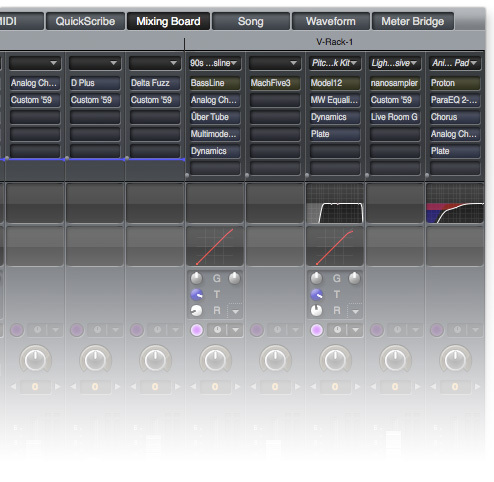 Display any type of automation data you wish, for audio tracks, instrument tracks and MIDI tracks. 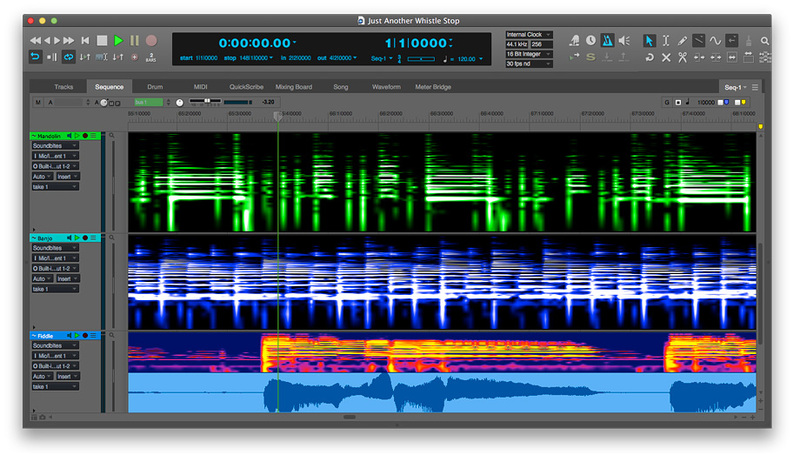 Digital Performer 9 can display the spectral content of each audio track, side by side with their waveforms, directly in the Sequence Editor time line. 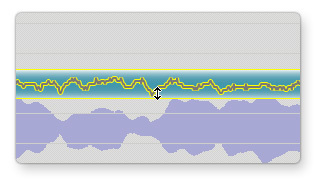 Vertical position represents frequency; brightness represents intensity. This gives you a colorful, informative visual representation of the frequency content of your tracks within the context of surrounding tracks — and your entire mix. 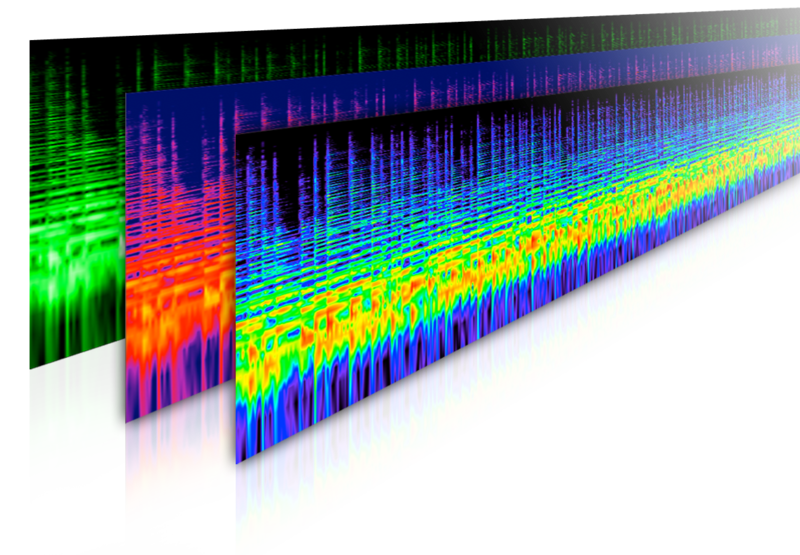 The Spectrogram display can be invaluable in helping you effectively balance and manage the frequency content of your mix over time. Choose from among a dozen compelling color schemes. Digital Performer 9 takes full advantage of your Mac's Retina™ display, delivering stunning graphic resolution, clarity and color depth to your Digital Performer experience. Working with plug-ins in Digital Performer has just become a hands-on experience: now you can sweep filters, morph macros and toggle bypass switches with the physical controls on your favorite MIDI controller. Mapping is easy: just click the Learn button and hit your controller. Molding your sound has never been more interactive. 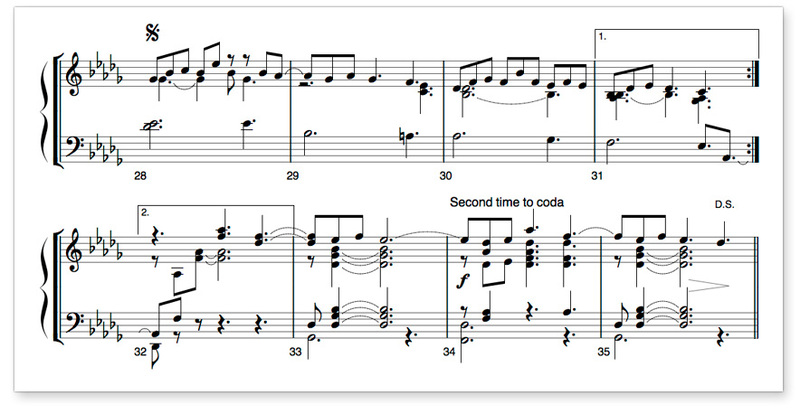 Digital Performer's QuickScribe notation window has long been recognized for its elegant transcription of non-quantized MIDI tracks. 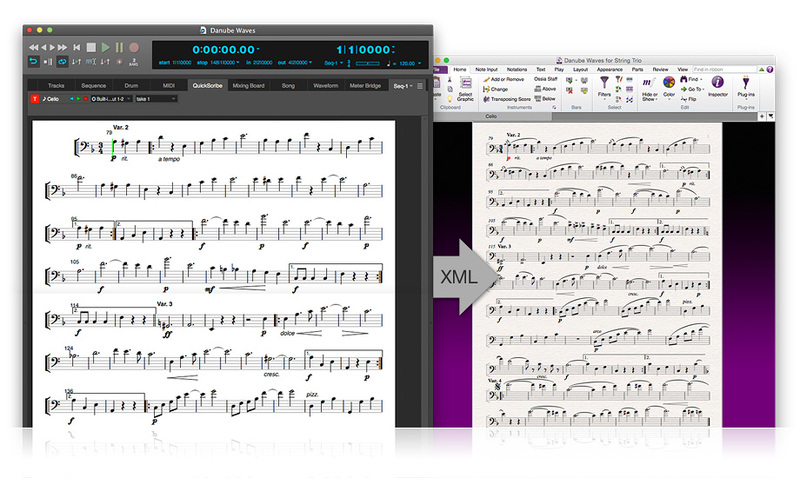 DP9's new MusicXML export feature lets you transfer QuickScribe's beautiful notation to other MusicXML-savvy notation programs, such as Finale™ and Sibelius™, while preserving QuickScribe's elegant transcription, including key signatures, meter changes, dynamic markings, lyrics, transpositions and even marker text. Your score will look fantastic and you'll save huge amounts of time because you won't have to "clean up" the score in the other program. 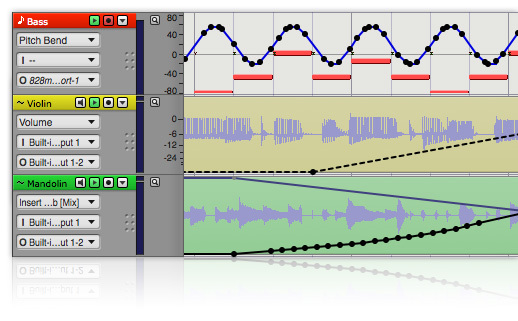 Create Tracks lets you make dozens of audio, MIDI and instrument tracks in one operation. Quickly set up new projects or add tracks to existing projects. Now you can save text notes in your DP project, rather than in a separate text document. Log production info, keep a To Do list, build up liner notes. Like most list windows in DP, the Markers and Chunks windows now have search fields, allowing you to quickly find markers and chunks when the lists get long. DP's Mute tool is a convenient way to temporarily mute audio regions. Now it can mute MIDI notes, too — even multiple selected notes with one click. Keep your potent processors front and center as you work. Set the floating preference globally or choose to float on a per window basis for complete control. 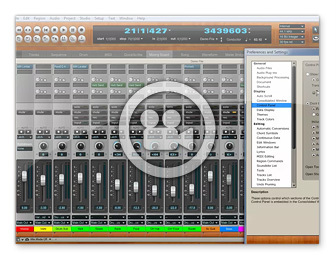 Digital Performer represents a complete studio production experience on your computer desktop. Record, edit, mix, process and master polished recordings. Combine external hardware — synths, controllers, mics, instruments, compressors — with virtual instruments, loops, audio tracks and MIDI tracks, all together in a seamless, intuitive production environment. Work musically with features like the Drum Editor and QuickScribe notation, then switch gears for creative production techniques with inspiring plug-ins like DP's Subkick, Ensemble Chorus, and guitar FX plug-ins. Import loops, launch virtual instruments and 3rd-party plug-ins: Digital Performer is the consummate host. 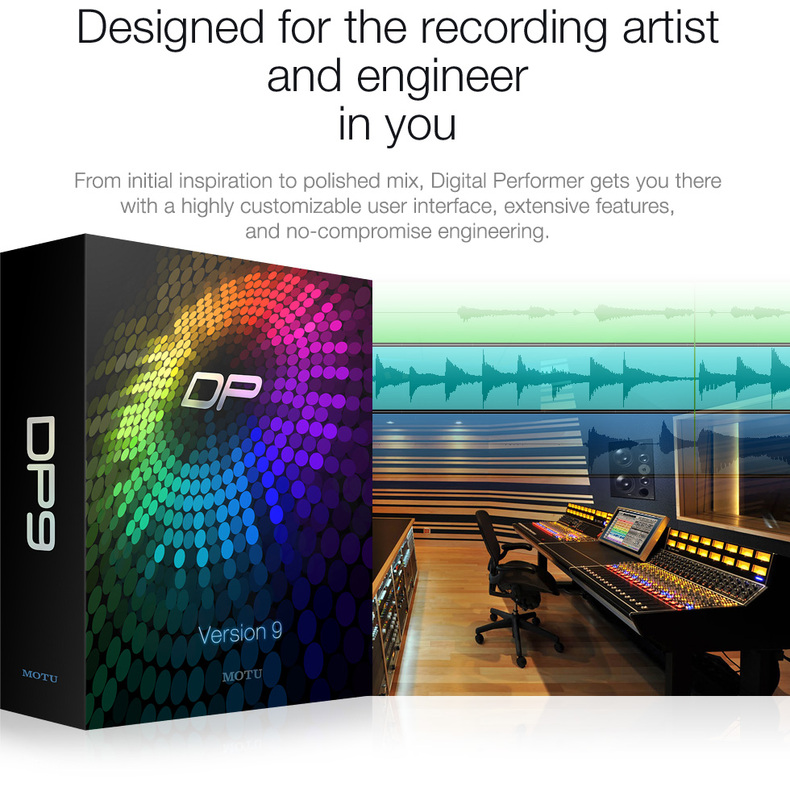 Then polish your recording with Digital Performer’s extensive editing, mixing, processing and mastering tools. No matter how you approach your music and audio production, DP's highly customizable user interface empowers your personal workflow. Digital Performer excels at bringing together the worlds of MIDI sequencing, multitrack audio recording, virtual instruments, and loops and sound libraries. Work with all forms side by side, with dedicated editors for each, but also common editing, mixing and processing features that work in the same familiar fashion. Digital Performer's Consolidated Window streamlines your workspace. 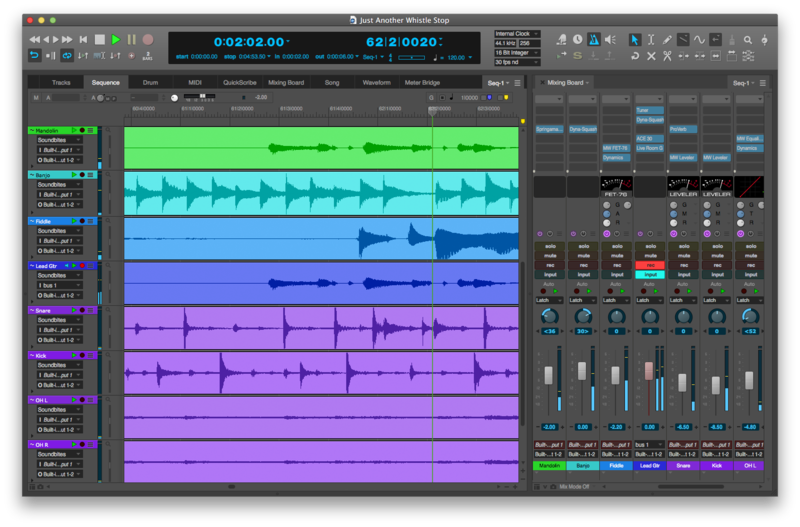 Quickly access major features such as the Sequence Editor, Mixing Board and Waveform Editor with tabs across the top of the window. Split the window vertically to view critical information side by side. Add side bars for commonly used lists and info panes. Create and save multiple custom layouts. 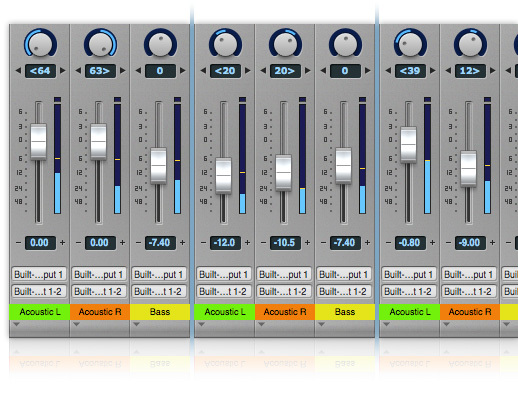 Factory presets are provided for tracking, editing, mixing and other stages of your workflow. Feeling fanciful? Release your mind with Zen. Need a boost? Energize your creativity with Plasma. Hosting a client? Impress them with Producer. Several dozen presets are provided, and you can even customize your own look. Use the theme browser below to preview DP's preset themes such as Hi-Fi, Arctic, and None More Black. Exploring Digital Performer's included themes is downright fun. For further inspiration, check out these additional themes offered by third-party developers and hobbyists. Lovingly crafted, these looks for Digital Performer are sure to stimulate your muse and perhaps even surprise you. What color are your level meters? This may sound like a personal question, but the truth is, level meter color can often be the subject of strong debate. In DP, you can choose any color you want to perfectly match your favorite theme. You can even design a two- or three-color gradient. Audio waveforms are the most graphically significant element of your workspace, and Digital Performer lets you dial in the exact amount of color saturation and lightness you prefer, independently for both the waveform and its background. 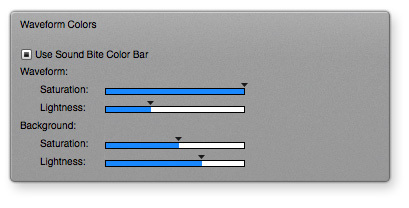 You can also choose to show or hide a solid color bar across the top of each waveform clip. The Control Panel provides essential information in compact strip across the top of your computer screen. Float it indepedently, or pop it into the Consolidated Window. Configure it however you want with extensive preferences. Digital Performer gives you complete control over this critical component of your creative experience. In addition to the highly configurable Consolidated Window, DP's dozens of themes, and the other customization features already mentioned, Digital Performer provides extensive preferences for configuring your workspace and how it responds to you. After all, a creative workspace is a very personal thing. And the time we get to spend there is precious, so you deserve every opportunity to maximize your experience. Digital Performer is still the only audio workstation application that allows you to create multiple sequences in a single project. Regardless of what you create with DP, you'll undoubtedly end up producing multiple versions of it. Why not have them all in the same project file, at your fingertips, using the same effects processing and virtual instrument resources? Need to use Digital Performer for live performance? Create a single file with all your songs in it, organized into 45-minute song sets or however you like. Digital Performer is the preferred workstation software for live touring, due in large part to this essential feature. Digital Performer's ability to assist you in creating and managing multiple sequences is unparalleled. When you work fast, it's nice to know that you'll never hit The Wall. 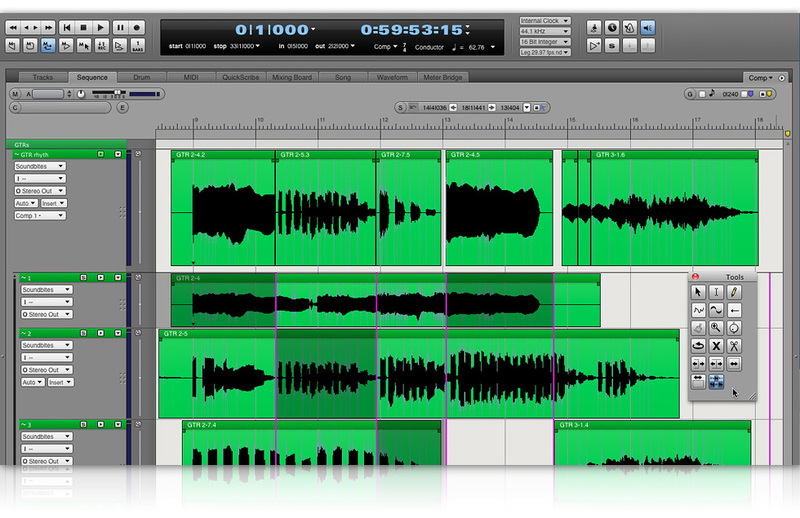 In Digital Performer, create as many tracks as you like. Add as many sequences as you need. Recording multiple takes? Do as many passes as necessary. Digital Performer has been designed to accommodate an open-ended workflow, where ideas can run rampant and limitations, if you need them, are completely up to you. Put folders within folders for as many levels as you need. Assign a unique color to the tracks in each folder to further enhance your project organization. Track folders show an overview of their contents in the Tracks Window. 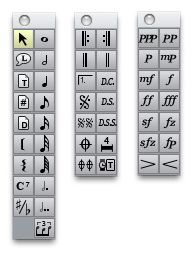 Track folders can be fully edited when either collapsed or expanded, and they even have their own track controls (play-enable, lock, solo exempt, etc. ), just like individual tracks. Track folders appear throughout Digital Performer in all windows that show multiple tracks, including all track show/hide selectors. Option-click and command-click shortcuts help you quickly collapse and expand multiple folders, or even all folders. 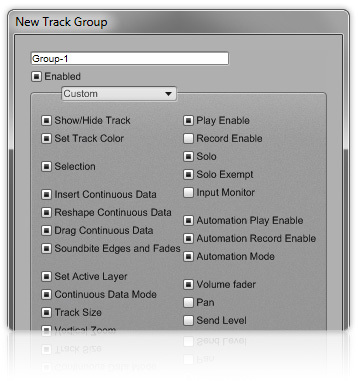 Track groups work in concert with, or independently from, track folders and allow you to link tracks from a functional standpoint, for mixing, editing or both. 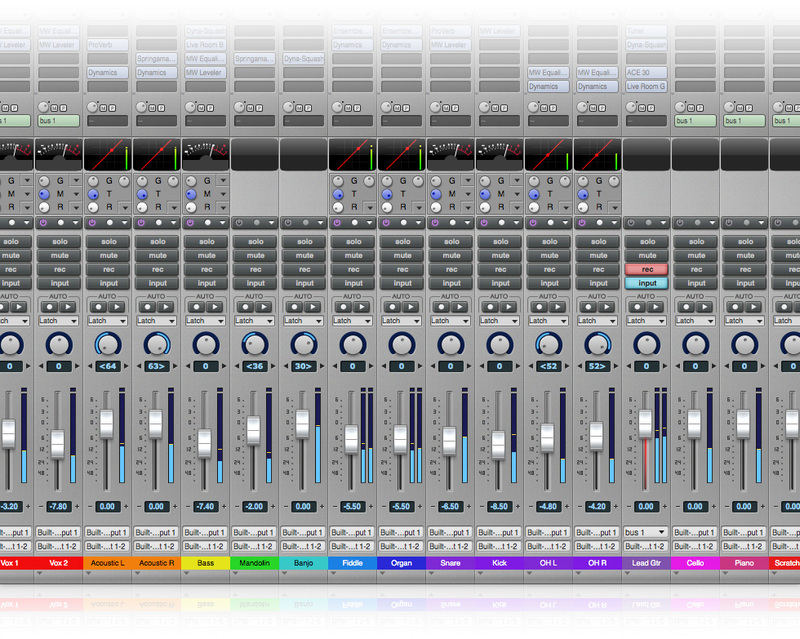 For example, grab a fader in a mix group and all other faders move too, in a relative fashion. The same holds true for mute, solo, and a host of other mix parameters, and editing as well. Pick and choose what elements are affected by the group. Temporarily override with a modifier key for quick tweaks. Even create unlimited, nested groups. If we had to choose one phrase to describe Digital Performer's no-compromise approach to digital music and audio production, it would have to be: sample-accurate. 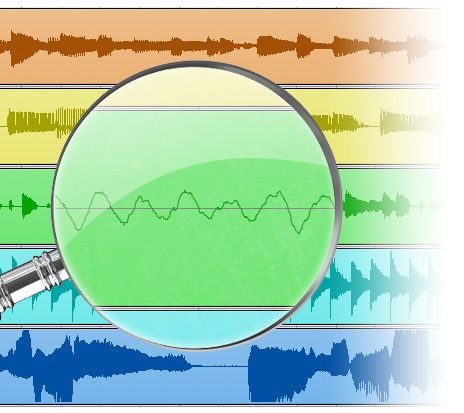 The shocking truth is that some audio applications don't maintain phase coherence during editing: as soon as you make an edit, the resulting audio clip is now shifted a few samples from its original position relative to other tracks. The results are insidiously disastrous. Never in Digital Performer. DP has been engineered with the utmost devotion to sonic integrity. Regardless of whether you work at 192 kHz with 32-bit floating point audio files, or plain old 44.1 kHz 16-bit audio, Digital Performer is faithful and true down to sample, for every edit, every fader move. For MIDI data, DP's factory default resolution is 480 parts per quarter note (PPQ), which is perfectly fine for most folks. If you’re a Logic or Cubase user who has switched to Digital Performer, you could choose 960 or 1920, respectively. For even better PPQ resolution, add extra decimal places (e.g. 960.000 or 1920.000). The maximum resolution offered? Just over 2 trillion PPQ. How is this incredible degree of precision possible? The number that Digital Performer uses to store the location of each MIDI event is a 64-bit number, which can express a range of numbers up to over 8,000,000,000,000,000,000. With transport controls modeled on a conventional tape deck, playback and recording can be as simple as pressing the play and record buttons. Many advanced features lie waiting, however, for even the most demanding studio situations: editing during playback, 'Partial-solo' mode, configurable event chasing, scrubbing, advanced click programming, input filtering and quantizing, multi-track recording of both MIDI and audio simultaneously, manual and auto punch-in, overdub recording, recording while slaved to external sync — these are just a few of the many features developed over years of time-tested performance in studios all over the world. Inspired by the classic Echoplex tape delay effect, POLAR™ stands for "Performance Oriented Loop Audio Recording". 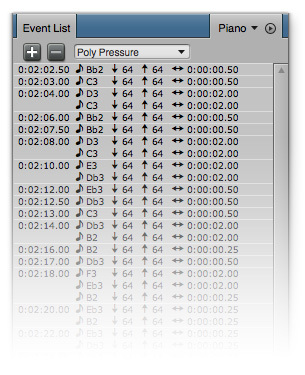 POLAR allows you to continuously loop-record vocal comps, beat-boxing, guitar, or pretty much anything, overdubbing each pass to build up vocal stacks or layered audio loops of any length with any number of layers. Many options are provided to facilitate real-time interaction with the computer, allowing you to record ideas quickly and spontaneously. 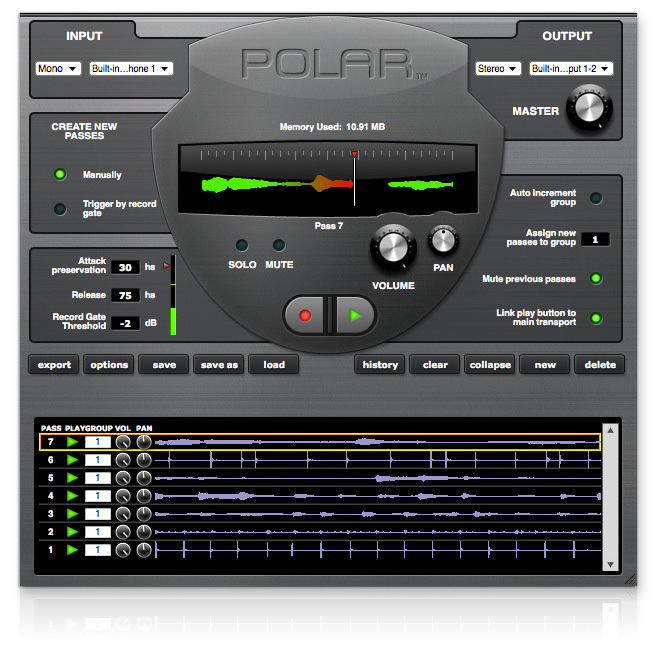 POLAR provides a seductive form of interactive loop-recording that produces results you might never have imagined. Be prepared to lose track of hours as you explore interactive layers upon layers. For truly amazing looped effects, try changing the length of the record loop between passes. Now try loops of odd lengths repeating against each other. (3 bars against 7, anyone?) The results can be mind-blowing. When you're done, hit Export to blow the entire POLAR session into your Digital Performer project for further editing, processing and mixing. 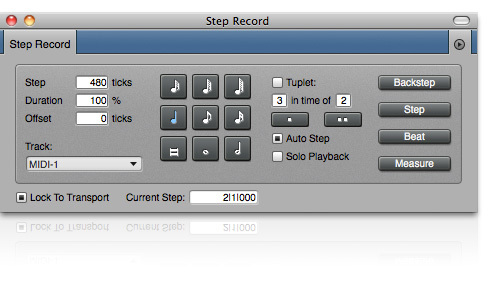 Step Record lets you enter MIDI material one note at a time. Sure, you can always draw notes graphically with the pencil tool, but sometimes it's more fun — and musically productive — to actually play a phrase or part, even if it's only note by note. Often the results are much more interesting than graphically entered material. Create insanely fast passages that would be impossible for a human to play. Or enter normal parts when your chops aren't up to the task. The uses for Step Record are infinite. When you're tracking, recording multiple takes is essential: it frees you up and allows you, or the artist, to get in the moment, be oneself, and perform the ultimate lick or phrase. Digital Performer lets you record into an unlimited number of takes and then quickly combine them into the perfect composite or "comp" take. 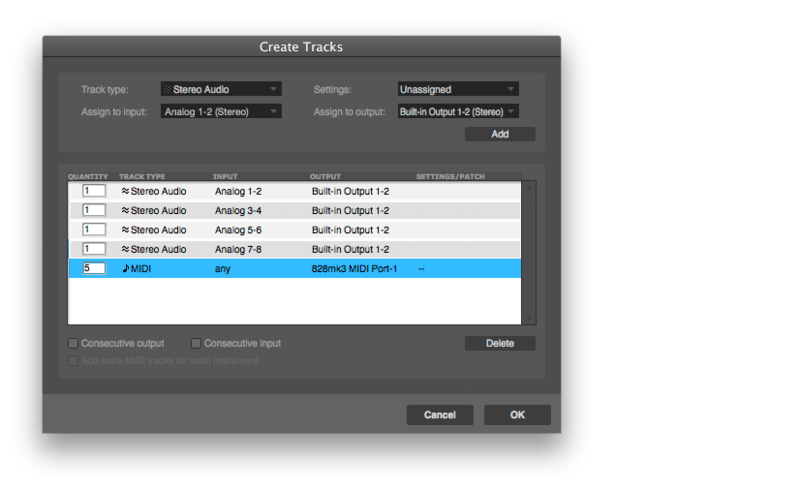 Quickly expand the track list to display all takes, just like separate tracks, but specially linked for quick one-click comping. Then collapse them when you're done to conserve screen space. You can always go back to tweak them again later. DP's takes and comping features let you do in minutes what used to take hours. Digital Performer's edit windows are so well-equipped with features, they could stand as separate applications on their own. Each window is loaded with features dedicated to each form of data, with the Sequence Editor serving as the grand master that displays all tracks and data together, side by side. 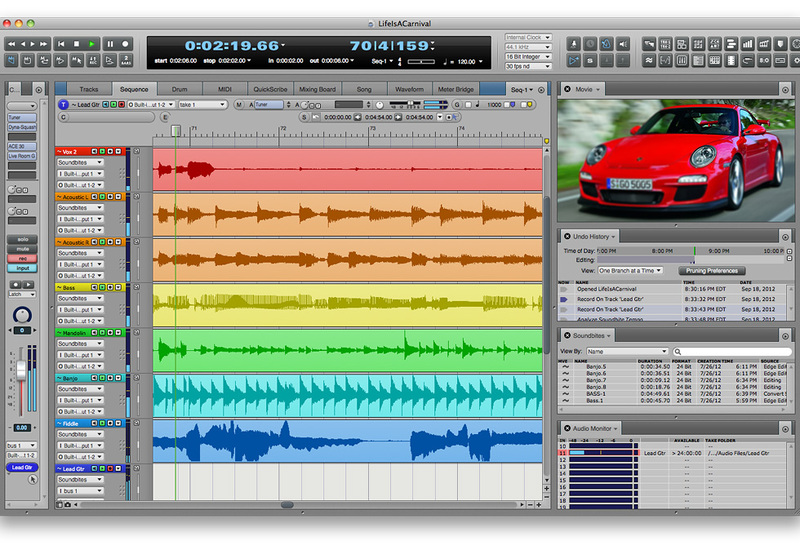 Digital Performer can display the spectral content of each audio track, side by side with their waveforms, directly in the Sequence editor time line. Vertical position represents frequency; brightness represents intensity. This gives you a colorful, informative visual representation of the frequency content of your tracks within the context of surrounding tracks — and your entire mix. The Spectrogram display can be invaluable in helping you effectively balance and manage the frequency content of your mix over time. Choose from among a dozen compelling color schemes. Digital Performer’s Mixing Board window provides a powerful integrated mixing environment for MIDI, audio, and instrument tracks in channel configurations from stereo up to 10.2 surround, along with real-time effects processing and virtual instrument plug-ins. The Mixing Board will seem familiar to beginners and experts alike because it is modeled after standard hardware mixing consoles. Lurking under the hood, however, are many powerful features and many time-saving shortcuts. With internal 32-bit floating point precision throughout the mixing path, combined with 64-bit precision during the mastering stages, audio quality is unparalleled. Control EQ and dynamics processing directly in each Mixing Board channel with multi-band graphic EQ display and vintage-style compression meter, using any included EQ or dynamics processor, such as Digital Performer's award-winning MasterWorks Series modeled British console EQ and leveling amplifier faithfully modeled after the legendary LA-2A. 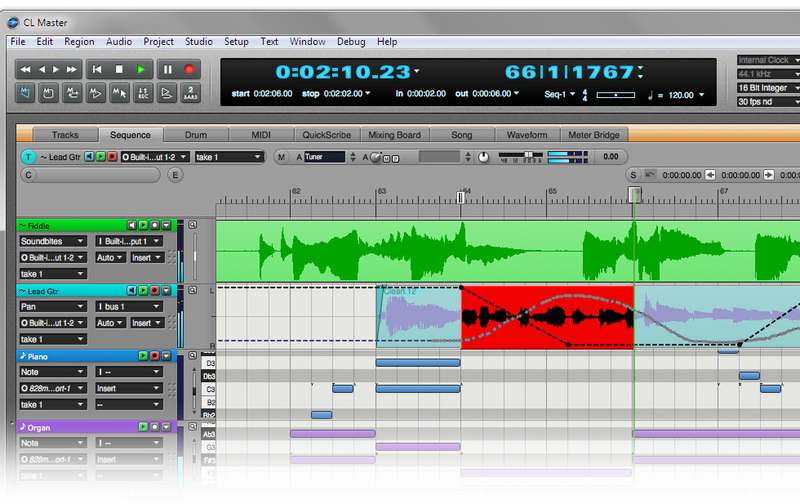 Work with audio, instrument, and MIDI automation side by side, seamlessly. Draw automation by hand using a variety of tools with various shapes. 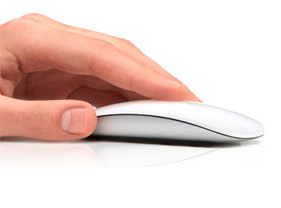 Record in real-time with mouse gestures or a hardware control surface. Overwrite new automation or trim existing curves, in real time. Take automation snapshots across any or all tracks. 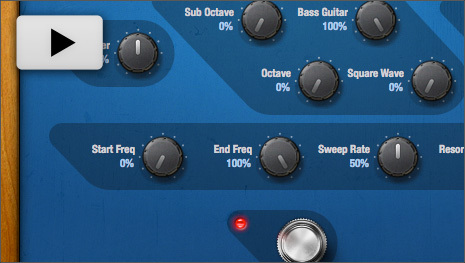 Create beat-based, tempo-locked automation effects. Work with broad gestures or pin-point precision. 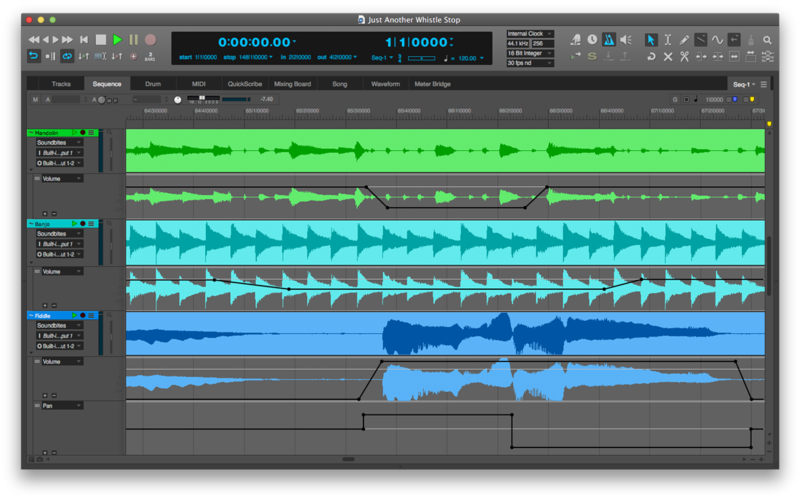 Digital Performer’s mix automation features are deep, yet easy to use. Plug-ins can be fully automated with ramps, stair steps or other behaviors appropriate for each parameter. The management of automation parameters is optimized throughout the program for efficient and intuitive operation. For example, only parameters that are actually being automated are displayed in lists and menus. Automation snapshots provide many options: they can include all parameters or only those currently being automated. The Channel Strip sidebar cell in Digital Performer’s main window displays all the mixer channel settings for the track you are working on, for immediate access. 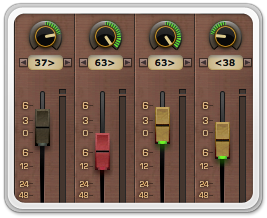 Plus, every edit window in Digital Performer can display a "miniature" mixer channel for quick access to mix settings for the track being edited. Crucial miix settings are always at your fingertips. Digital Performer’s Mix Mode menu in the Mixing Board lets you create, save, edit and switch between multiple mixdowns of your project. For example, you could create several completely different mixes of the same sequence. 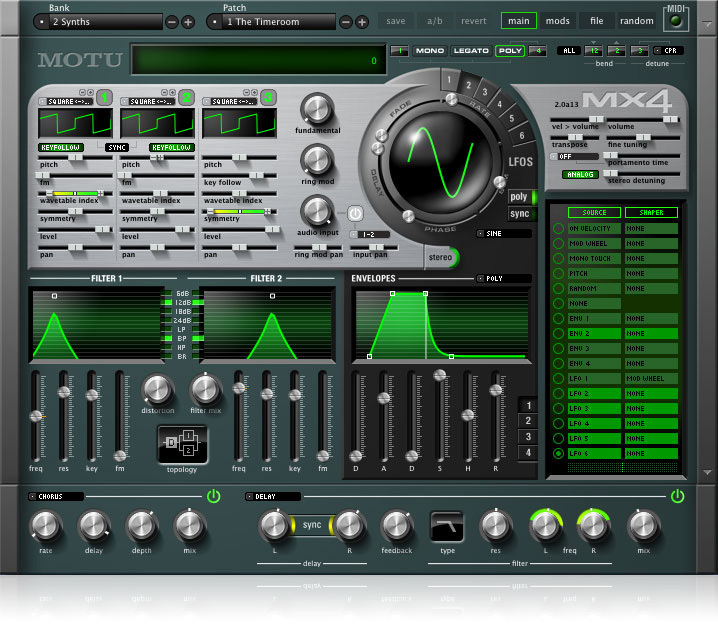 A mix consists of all the volume, pan, plug-in and other mix automation data in all the tracks of the sequence, as well as all of the current plug-ins inserted on tracks. Get hands-on control of your mix with third-party automated control surfaces, such as the Avid Artist Series controllers (shown), Mackie Control Universal, or other HUI-compatible controllers. Adjust plug-in settings, automate filter sweeps in real time, and trim your mix with touch-sensitive flying faders and v-pots. It’s like putting your hands on DP itself. Digital Performer set the industry standard for how pitch automation should be handled in an audio sequencer: as a non-destructive automation layer, directly in the track. Often imitated, but never matched, Digital Performer's elegant pitch editing makes pitch correction a breeze, and a joy to work with. From minor corrections to major transpositions, you have every degree of control you could ever want over the pitch of vocal tracks, solo instruments (such as saxophone), or a variety of other pitched monophonic audio material. Need to do a little pitch correction on a vocal track? 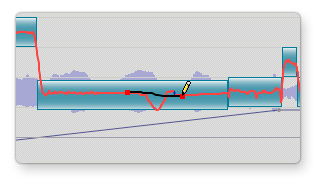 Click the pencil tool and simply draw in the corrections. You can even loop the audio and make changes in real time, within the context of your entire mix. Pitch correction has never been easier. Use formant-corrected pitch shifting for more natural-sounding results or standard pitch shifting for creating special pitch effects. 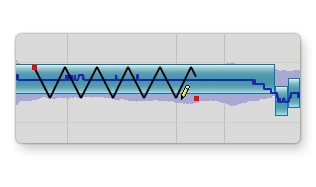 For truly unique pitch-shifting mayhem, use DP's automation drawing tools to shape the pitch curve into periodic waveforms (sine, saw, square, etc.) — you've never heard anything like it! 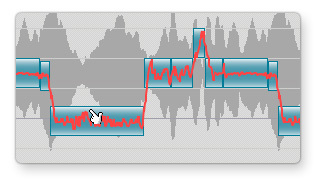 Need to actually change a note in the vocal or other recorded instrument track? Just grab the pitch segment for the note and drag it up or down to the desired pitch. 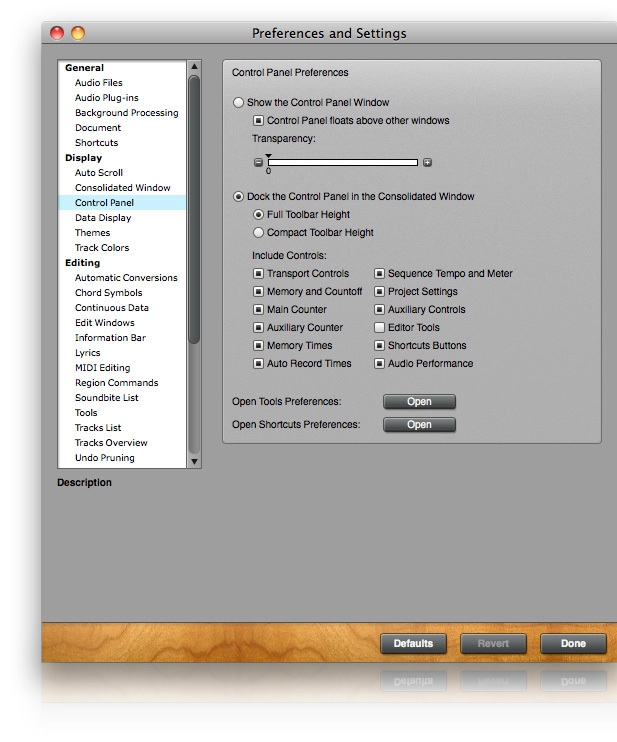 Command-drag to make micro-tonal adjustments. Digital Performer adjusts the pitch curve accordingly, ensuring a smooth transition between the note you drag and surrounding notes. You can even scale the pitch curve to either reduce or enhance vibrato or other variations in pitch. Need to just clean up an overall "pitchy" vocal performance (as American Idol's Simon Cowell would say)? Select the whole track and choose the "Quantize Pitch" command. All notes snap to their nearest centered pitch. Don't like the results? Simply Undo. Or hand tweak individual notes. 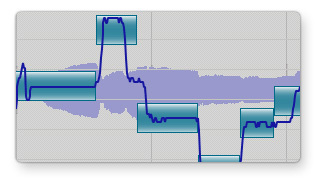 All of the pitch changes occur in real-time, so your original audio is perfectly preserved, down to the sample. Digital Performer's Transpose command gives you complete freedom when it comes to transposition. 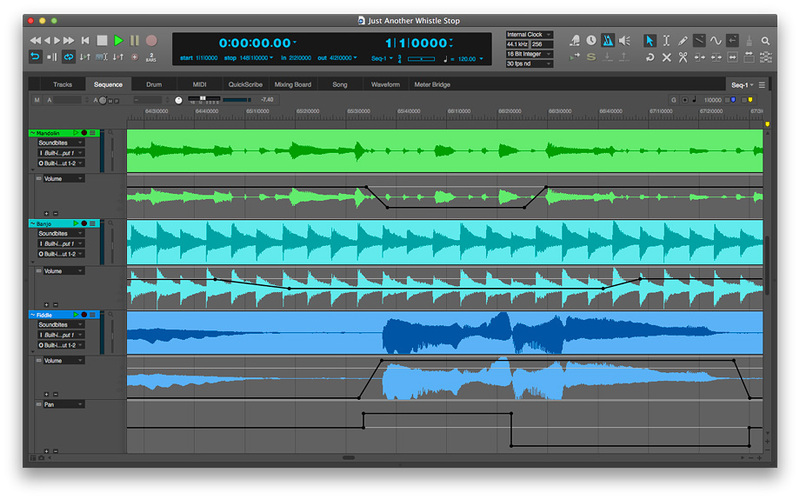 And now you can use that same familiar feature to transpose your audio tracks as well. From simply transposing up or down by a fixed interval to transposing entirely from one mode or key to another, the creative possibilities are endless. Try a different key. Harmonize a vocal. Use the custom pitch map to transpose specific notes to another note. 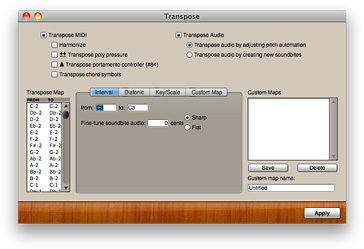 Transpose audio and MIDI tracks in one operation. Got an audio performance that you'd like to convert to MIDI data? 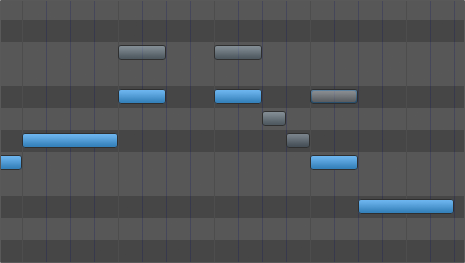 Copy Digital Performer's pitch segments from the audio track and paste them into a MIDI track. Clean them up a bit with quantize, etc. and you've now got a MIDI track that matches the audio performance. Layer a vocal with MIDI instruments, or sing in a melody and then convert it to MIDI for further development and orchestration. Let your imagination run wild. Once again, Digital Performer blurs the line between MIDI and audio, giving you a seamless, intuitive environment for both. What's a V-Rack? 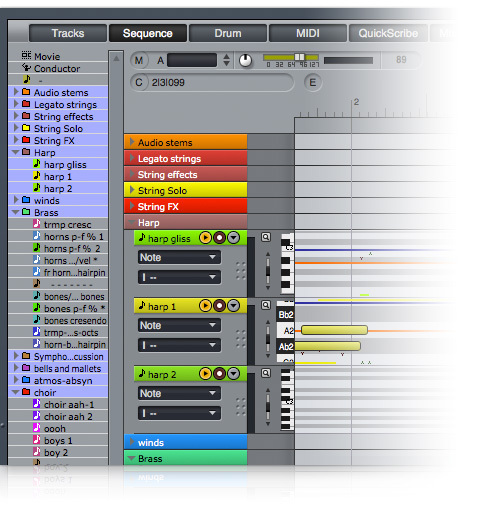 It's a place to load virtual instruments and effects that are available to all sequences in a Digital Performer project. A V-Rack™ looks and operates just like a sequence, except that it holds aux tracks, virtual instrument tracks and master faders — no disk tracks. Any effects or instruments loaded in it are accessible from all other sequences in your Digital Performer project. 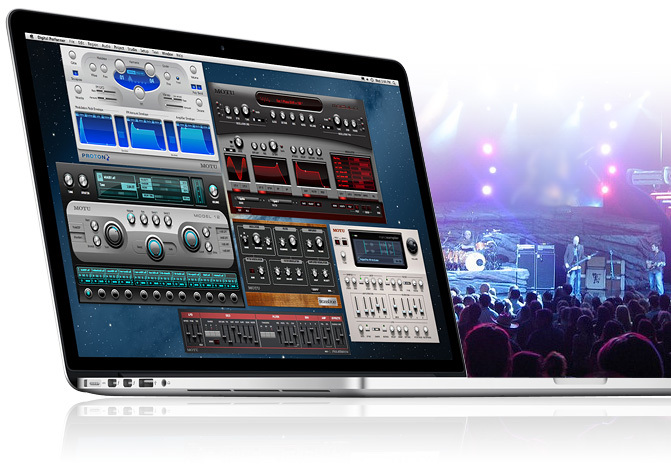 It's like having a virtual effects and instrument rack — just like the name V-Rack implies. 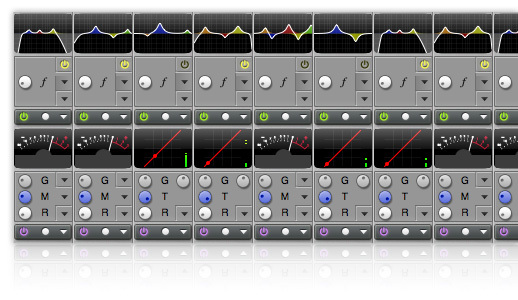 Use V-Racks any time you have multiple sequences that share the same effects processing or virtual instruments. For example, you might load one instance of MachFive in a V-Rack and then play it from each of three different sequences, rather than having to load MachFive three times (once in each individual sequence). This saves you tons of CPU power and RAM, not to mention load time. 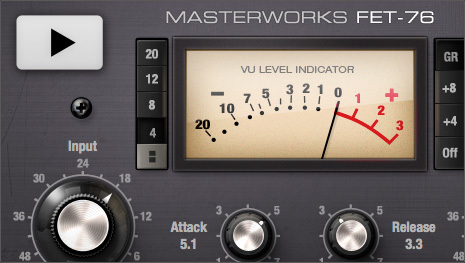 You can also use V-Racks for building a mastering chain (via a master fader), to which you then feed the master output from multiple sequences to achieve absolute consistency during mastering. You can use the same technique for consistent effects/return loops. V-Racks are also great for virtual instruments or effects processing during live performance. The Mixing Board allows you to view and mix V-Rack channels side by side with all of your sequence tracks, for a seamless integrated mixing experience. 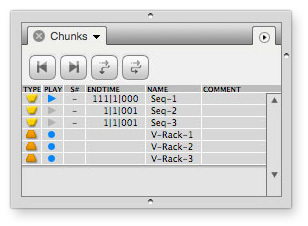 Tabs at the top of the Mixing Board channels clearly identify V-Rack and disk track channels. 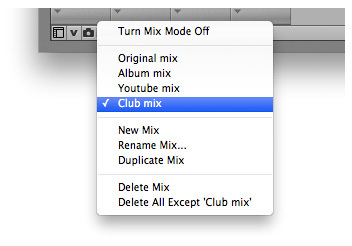 In all other respects, mixing is entirely consistent and intuitive across all channels. 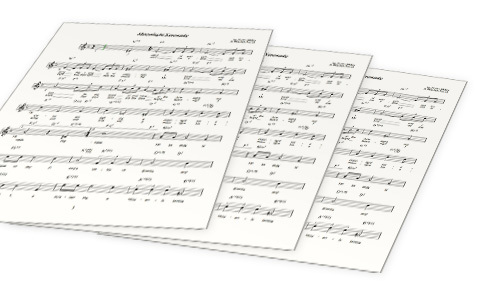 From lead sheets to orchestra scores, Digital Performer provides sophisticated music notation transcription, including special scoring features for film composers that you won't find anywhere else. If the notation display looks like a train wreck because it wasn't recorded to the metronome, DP's Adjust Beats feature lets you graphically drag beats and barlines to line them up with MIDI note data - without changing how it plays back. The result? Readable notation and time rulers that match your music. Simply point and click to add adjustable dynamics symbols, page text, and score arrangement items such as first and second endings, codas, rehearsal numbers, title, composer, copyright notice and directions to musicians. Digital Performer's QuickScribe window provides an on-screen, full-page, what-you-see-is-what-you-get environment for page layout and formatting. Control staff spacing, system spacing, measure spacing, measure numbering and many other layout features. 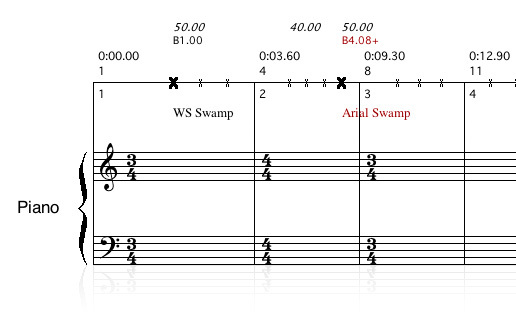 Format and print separate multi-staff scores and individual instrument parts, all from the same sequence. Each instrument part can have its own clef and instrument transposition. 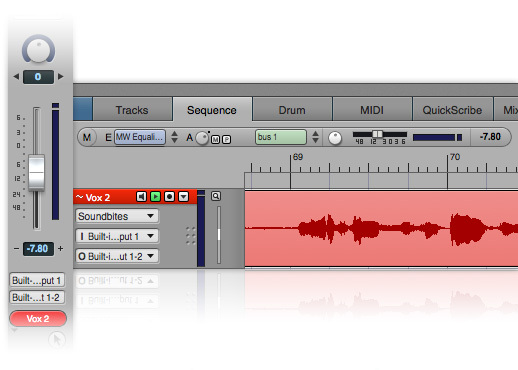 Make edits either in the score or when viewing individual parts — or even in the event list or MIDI Graphic Editor. 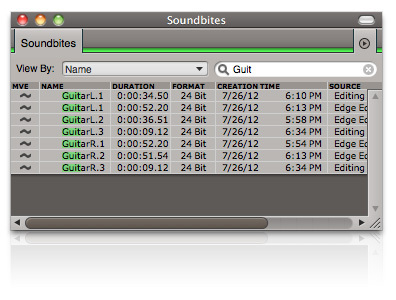 All are dynamically linked to the source MIDI tracks and update instantaneously across all editor views. Digital Performer's arrangement features make your scores and lead sheets look professional and readable. In an arranged score, you use repeat barlines, endings and other similar arrangement symbols to condense your linear sequence. 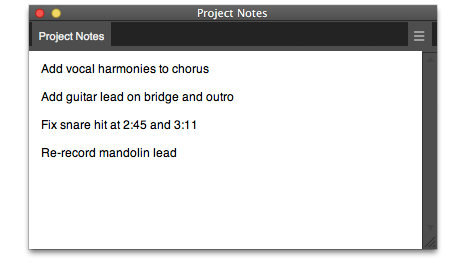 For example, lead sheets are usually condensed to one or two pages. In Digital Performer's QuickScribe window, you simply point and click to add repeats, multiple endings, consolidated rests, segnos, codas and even double codas. Then choose Show Arranged Score and your linear score is displayed in arranged form. Playback proceeds through the arranged score as it should, and measure numbers are preserved through repeats and endings. Advanced features are provided for choosing what measures are displayed during multiple repeat sections. 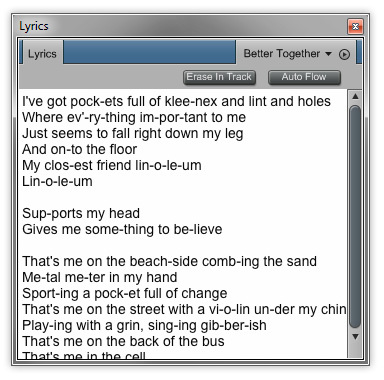 Click with the Lyric tool to enter lyrics directly on the page. Or type text into the Lyric window. You can even paste in lyrics from an email or text editor and then automatically flow the text into one or more parts (tracks) with one click. Add multiple stanzas. 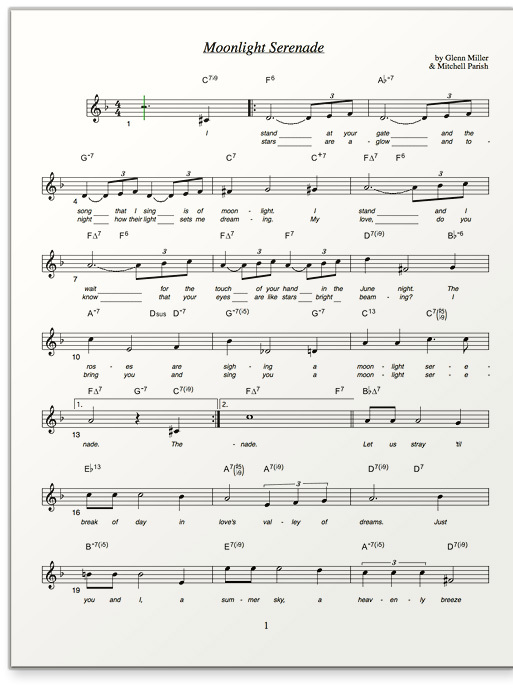 Lyrics even follow the QuickScribe window's advanced score arrangement features (repeats, multiple endings, codas, etc. ), flowing through repeats and ending as required. Choose any font and format the type as you wish. Click with the Chord tool to add chord symbols directly on the page. Digital Performer can easily handle complex chord spellings and extensions. Best of all, you can select and transpose chord symbols at any time, together with or independently from notes. Digital Performer is used world-wide by film composers because of its unparalleled advanced features for scoring to picture. 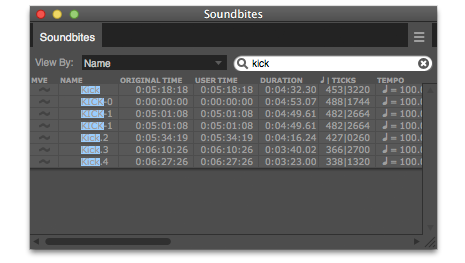 Developed in collaboration with film composer Howard Shore during the scoring of the entire Lord of the Rings (LOTR) trilogy, the QuickScribe window provides a special Film Cues view, which displays cue points (markers) with respect to beats on a time line above each staff system, complete with SMPTE time code locations, beat locations and the nearest beat or half-beat. Meter changes, key changes and tempo changes can be inserted directly on the staff with convenient pop-up menus. These features were used for the LOTR scoring sessions at Abbey Road Studios in London. 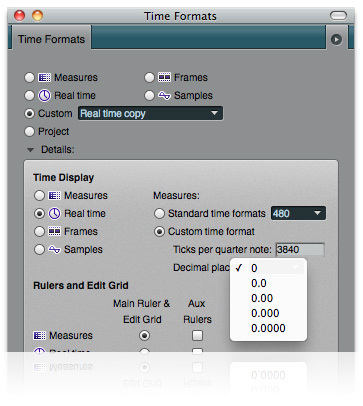 Digital Performer provides a separate QuickScribe window for each sequence in a project. For example, if you have three sequences, you could open three separate QuickScribe windows all at once, one for each sequence. This allows you to easily view, compare and edit multiple scores simultanously, side by side. 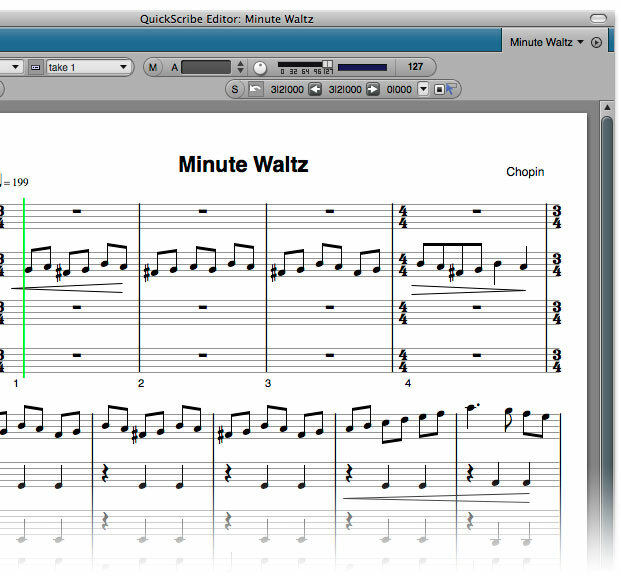 Digital Performer's QuickScribe notation window has long been recognized for its elegant transcription of non-quantized MIDI tracks. 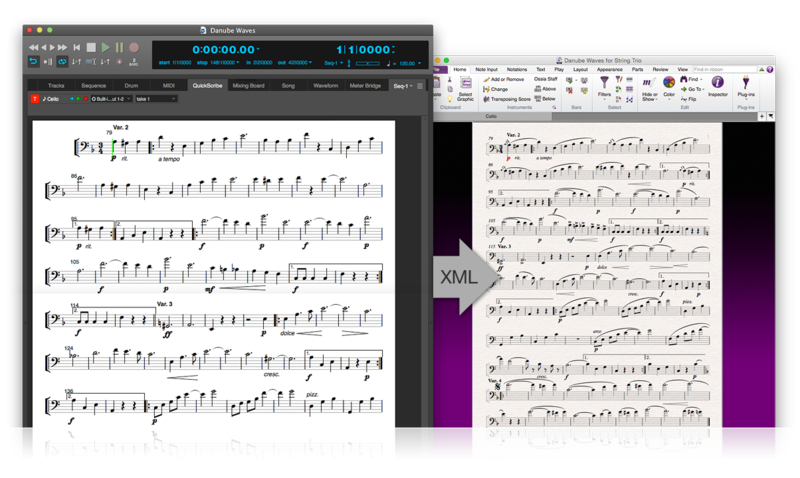 DP's MusicXML export feature lets you transfer QuickScribe's beautiful notation to other MusicXML-savvy notation programs, such as Finale™ and Sibelius™, while preserving QuickScribe's elegant transcription, including key signatures, meter changes, dynamic markings, lyrics, transpositions and even marker text. Your score will look fantastic and you'll save huge amounts of time because you won't have to "clean up" the score in the other program. Quickly zero in on an audio clip, custom key command, or other list item in just seconds by simply typing the name of what you are looking for. The list updates as you type, immediately showing any items that match your search. Become a DP power user with one right-click of your multi-button mouse. Digital Performer's essential operations for any window, edit grid, or list view are now just a click away. You'll fly through your DP workflow like never before. The MasterWorks FET-76 is a detailed model of the 1176LN Limiting Amplifier introduced by UREI in 1968 (the D/E revisions). The 1176 uses FETs (Field Effect Transistors) to control audio gain reduction, with very fast response. 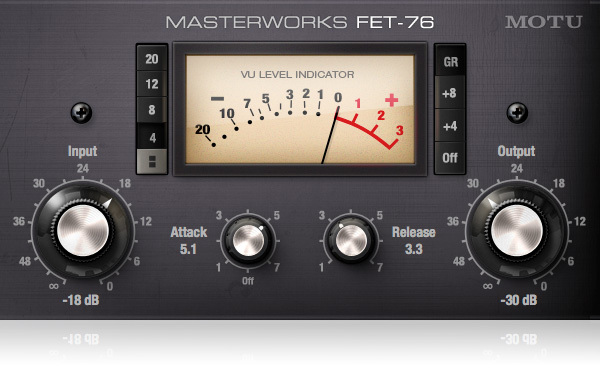 Popular for getting “big” sounds from bass, kick and snare, guitar, lead vocals, synths and even full mixes, the FET-76 provides the same controls and sound as the original analog hardware, including the ability to press multiple ratio buttons at one time for aggressive compression settings. 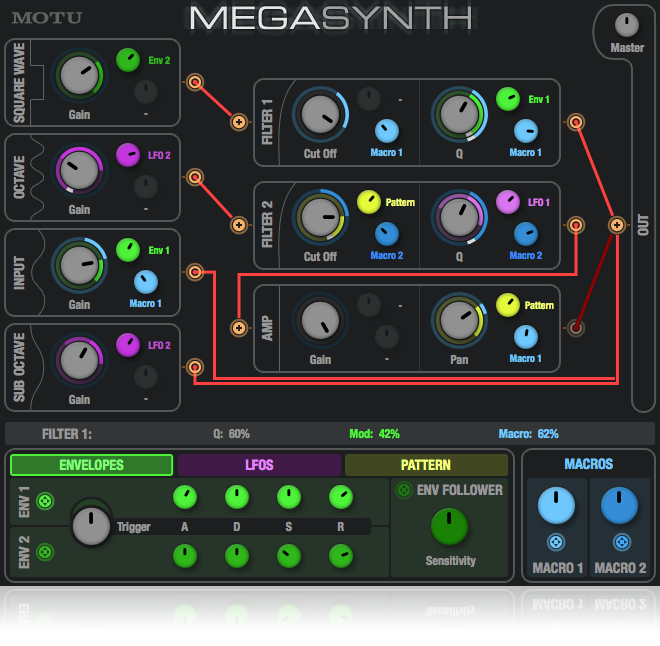 MegaSynth combines polyphonic octave generation with flexible signal routing, envelopes, LFOS, a pattern generator and macros. Input your guitar — or any signal — and let the synthesis mayhem begin! MegaSynth generates octave, sub-octave and square wave tones based on the input signal. You can mix, route and process the four signals (voices) in a virtually infinite number of ways with creative processing, including a programmable pattern generator, macros that control multiple parameters at once and an envelope follower. 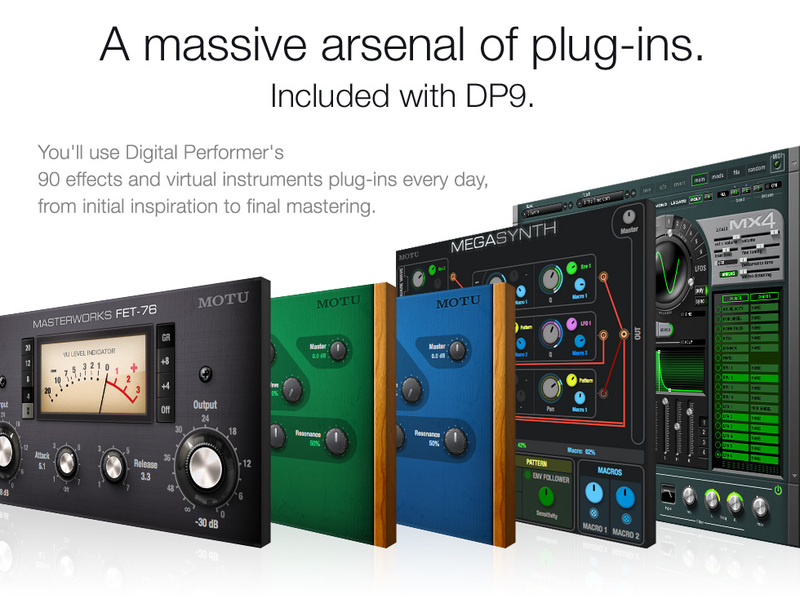 Meet the instrument plug-in powerhouse for your Digital Performer desktop. Inspired by legendary subtractive synthesizers, MX4 combines several core synthesis techniques in a unified, hybrid synthesis engine that delivers fresh and vintage sounds alike. 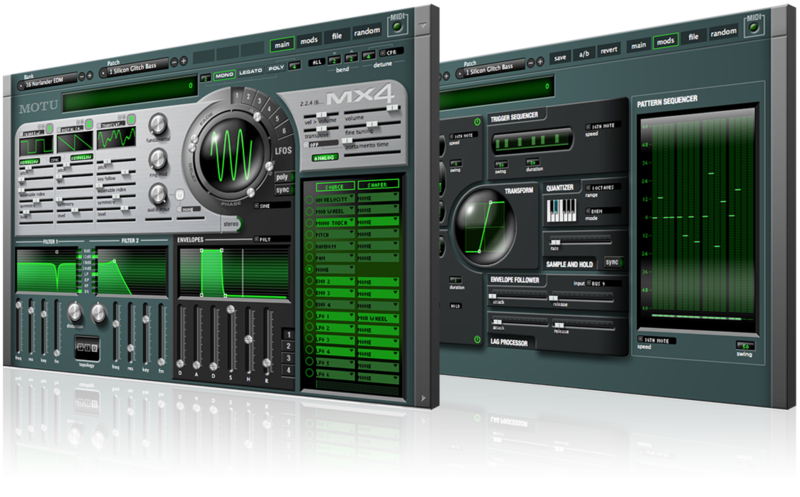 As you explore its many banks and hundreds of presets, you'll soon rely on MX4 as your "go-to" instrument. Fat basses, nasty leads, analog pads, vintage electronica — it's all at your fingertips and conveniently saved with your DP projects for instant recall. Tweaking sounds is fast and easy with clearly presented controls in one window — but with a depth and sophistication true synth programmers will appreciate. Create your music with pristine 32-bit sound quality, unlimited voices and unlimited polyphony (as much as your host computer allows). MX4's flexible programming and advanced modulation architecture provide the intimacy of a vintage synth, the flexibility of a modular synth, and the innovation of a virtual synth. MicroG is a subtractive synth processor that emulates a polyphonic octave generator (POG) streamlined for guitar. Try it on guitar, vocals, instruments or any type of signal for truly unique effects. 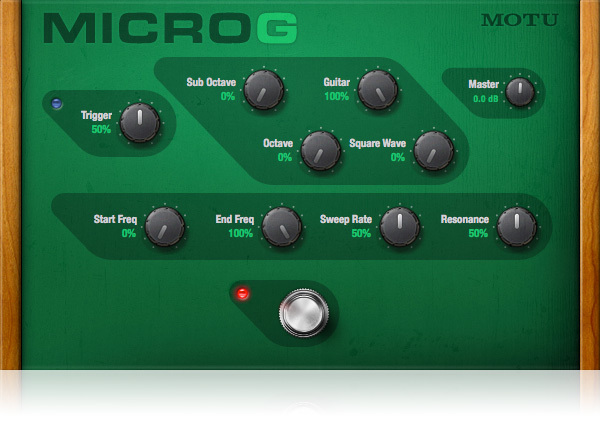 MicroG generates octave, sub-octave and square wave tones based on the input signal, combined with a gain-triggered filter sweep. 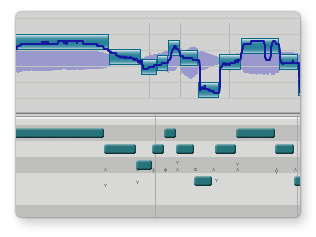 Tuned for bass guitar, MicroB adds octave, sub-octave and square wave tones in the bass register for polyphonic synthesis with enhanced bottom end. Get your Funkadelic on, with that classic bass sound from the 70's made popular by Parliament Funkadelic. But that's just the beginning with this synth processor. 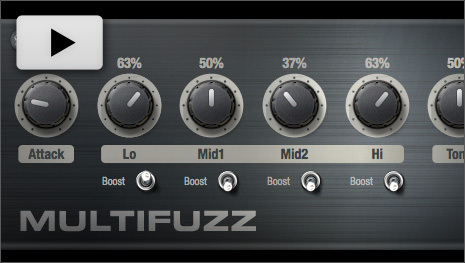 MultiFuzz is a spot-on reproduction of Craig Anderton’s legendary QuadraFuzz multiband distortion kit from decades past. Anderton developed a straightforward concept that produces absolutely monster guitar tones: divide the input signal into four separate frequency bands and then apply distortion independently to each band. The results range from sublime warmth to absolute filth.